Premium Grade Allergen Reduction 100% Synthetic Pleated Air Filter. Highly efficient electrostatic filtering material attracts dust and pollen like a magnet. Captures microscopic airborne dust, pollen, mold spores, pet dander, bacteria and the particles that carry viruses. 85% efficiency on 3 micron particles. Available in 1", 2" & 4" depths. Lasts 90 days. Rated MERV 11. "Odor Ban" filters are specifically designed for the removal of fumes, odors, pollutants and dust particles. Remove odors from cooking, new paint, new carpet, bathroom smells, cigarette and cigar smoke, pet odors, etc. For a complete listing of odors, gases and fumes removed by activated carbon. Rated MERV 8. The PerfectPleat M8 replaces the PerfectPleat. Superior performance. It is designed to reduce the number of allergens in your home or office including household dust, pollen and mold spores. 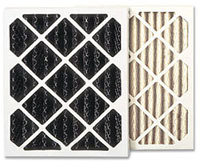 Heavy duty pleated air filter with self-supporting DuraFlex media. Available in 1", 2" & 4" depths. Lasts 90 days. Rated MERV 8.